Cheryl Regina Palmer, age 56 of 1154 Deerfoot Trail, Sanford, NC passed on Tuesday, November 6, 2018 at Sanford Health and Rehab. Cheryl Regina Palmer was born on January 10, 1962 to Pearlie and Alton Headen in Chatham County, NC and on February 4, 2018 she began her journey to everlasting life. On November 6, 2018, she was received to His home in Glory at Sanford Health and Rehab Center. Cheryl began her informal education in the public schools of Chatham County, graduating from Chatham Central High School where she participated in the choir and was crowned Homecoming Queen. She was loved and admired by the faculty as well as her classmates. 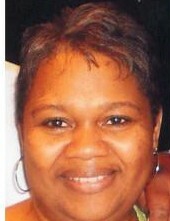 Cheryl was a graduate of Central Carolina Community College in Sanford, NC attaining her degree as a Medical Secretary. She continued her professional career at UNC Hospitals as a Medical Secretary for 19 years. Cheryl fellowshipped for many years at the Wesley Chapel Fellowship Church under the leadership of Pastor William Moses and Pastor Penny Moses. She participated in various ministries: the choir ushers ministry, Sunday School and various holiday programs; and loved being an integral part of the church ministries. She was a humorist, who had the ability to craft her own “funny stories” and extended jokes. She could make any room come alive with joy at her antics and muses. Chery continued her journey by uniting in Holy matrimony with Radley Terrill Palmer and becoming the proud mother of two wonderful boys/men: Wesley Terrill and Radley Quinn. Cheryl is survived by her two sons, Wesley (Monique) of Jacksonville, FL and Radley (Ana) of Asheboro, NC; mother, Pearlie Williams (Linel) of Sanford, NC; father, Alton Headen (Yvonne) of Bear Creek, NC; brothers, Mitchell Headen (Dena) and Kenneth Headen (Stephanie) of Siler City, NC; step brothers and sisters, Linel Dion Wingate of Raleigh, NC, Linel Williams III (Dana) Charlotte, NC, Lytondra Nefertiti Collins of Charlotte, NC, Jeffrey Hanner (Lisa), Bonita Nance and Steven Moffitt; two grandchildren and a host of nieces, nephews, other relatives and friends.